Even when there’s a guy like Masaaki Yuasa handling the adaptation of one of your favourite stories, there’s always a small worry that something won’t click. In Ping Pong‘s case especially, pairing Yuasa with mangaka Taiyou Matsumoto was almost too perfect, because as any one who has read Matsumoto’s other works will know (Tekkonkinkreet and Sunny amongst them,) his drawing style is really unique, favouring jagged and uneven lines, an aesthetic that’s also much like Yuasa’s own for Mind Game, Kemonozume and Kick Heart. Visually then, these two guys go against the grain, but that in itself is just a superficial thing and not reason enough to care. They also happen to be masters of their respective crafts. 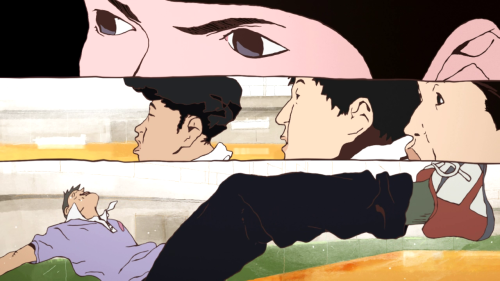 Kaiba, The Tatami Galaxy, Tekkonkinkreet, Ping Pong and Sunny. These two are amongst the best working in animanga today, so when the Ping Pong anime was announced, it felt too perfect; too much like a dream; something had to go wrong, right?! Actually, no. Three episodes in and Ping Pong has been brilliant. Speaking as someone who fell in love with the live action film version of Ping Pong many moons ago (and even wrote about it on this blog! It’s a great film, please watch it!) 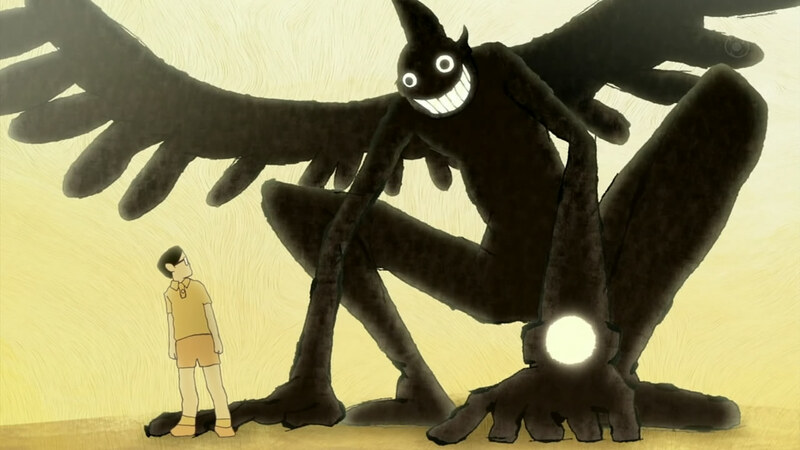 I feel like I know this story off by heart by now, but I’m still so excited to see Yuasa’s take on it, as well as my fellow anime fans’ reactions to it all. It’s really surreal for me to see people talking about obscure characters like Peco, Smile and Demon, characters that have been near and dear to my heart for years now. I just couldn’t be happier. Please keep watching it! In terms of criticism, the one complaint that I’ve found quite puzzling (or lazy) is that Ping Pong is “just another” sports anime, as though it’s a story that feels like it’s been done before? For the record, I can’t get enough of sports anime anyway, but Ping Pong is still nothing like Hajime no Ippo, Aim for the Ace, Cross Game, Slam Dunk or Ookiku Furikabutte. If it’s close to anything, it’s probably Kuroko’s Basketball, because both deal with young prodigies and what it means to be (un)talented. Obviously, Kuroko’s Basketball is an exaggerated version of basketball, but Ping Pong‘s depiction of table tennis is realistic, yet laced with surrealism. Again, perfect fodder for Masaaki Yuasa, a man capable of that memorable whale escaping sequence from the climax of Mind Game. What I’ve always loved about this story (and Kuroko’s, too, I suppose) is the way that these characters relate to each other: how Smile sees Peco, how Peco doesn’t realise that Smile idolises him, how everyone in this story is affected by everyone else around them. It’s about being responsible, trying hard, trying your best to use your talent. People close to you are watching you all of the time and you’re inspiring them without ever realising it. You’re their hero. That’s what Ping Pong has always been about to me: heroism, willing to try to live up to another person’s expectations of you. That’s not necessarily a healthy thing, but if you’re talented at something, people will look at you and be inspired. They believe in you. You’re a shining light to them. Don’t let them down. You’re alive?! Lol… Glad to see you’re still writing. I’ve become ridiculously selective with anime over the past couple years… Waiting for whispers of truly great ones like Attack On Titan last year. Gonna check out this Ping pong anime. Will you resume your year end top 10 lists? I haven’t read the manga but have been meaning too. I love Matsumoto’s Gogo Monster to DEATH. Yuasa of course is one of my favourite people in the industry. Ping Pong is amazing so far. It’s hard for me to believe, but I’ve only had cursory looks at both these artists’ works. Never a full series, not a single volume of manga … Well, Ping Pong is a great introduction to both. 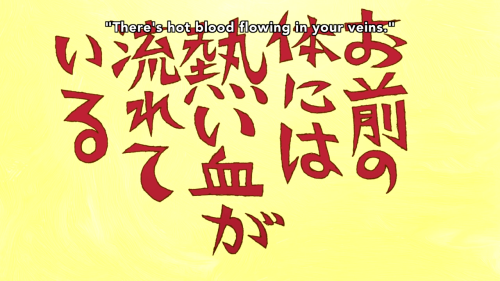 This show and Mushishi are in a class by themselves this season. Glad you’re enjoying it, Peter. I’d really recommend taking a look at Tekkonkinkreet if you’re up for investigating more Matsumoto. I’m having similar problems to you: I’m familiar with Yuasa’s style and I know the live-action Ping Pong adaptation too, so I have expectations of my own here too. I’ve not sat down to watch ep 3 yet, but the first two are very faithful…almost too faithful. I can see how it’s likely to succeed, but I also carry a hope that it can outdo both the older Yuasa titles AND do things that the film didn’t. I want to see the anime capitalise on the strengths of the animated medium…knowing its pedigree, I know they can do it! I hope so, anyway. Welcome back, by the way. I’m also suffering from sporadic incentives to write, but this is proving to be a strong season…it’ll be great to join another one of the ‘old school’ bloggers in celebrating stuff like a new Yuasa show, or more Mushishi. It’s almost like the old days right now! I was a big fan of Gatchaman/G-Force when I was a kid, Tekkonkinkreet was my first favorite manga/anime as an adult. I was a bit wary when I saw the post because like you I was worried it wouldn’t show as well as it read. This was an excellent first episode, and I look forward to watching the others on FUNimation. Thanks for the insights and the recommendation. Do you happen to know the name and release date of spakeprm’s book? Nope, sorry. All I know is what she’s tweeted about already, I’m sure she’ll be happy to know that people are looking forward to it, though. I gotta admit I had limited interest in a sports themed anime but anything by Matsumoto Taiyo or Masaaki Yuasa is worth checking out, and I’m so glad I did because it was amazing. I’ve always enjoyed Masaaki Yusa’s animation style, but I found myself connecting emotionally to the characters in a way I have not done so for a long time, and that’s the highlight of the series for me. I’ll have to check this out. I really liked the 2002 film.